First laid down as a seaplane tender in 1934 at Kure Navy yard, the ship supported reconnaissance float planes Kawanishi E7K Type 94 “Alf,” and the Nakajima E8N Type 95 “Dave.” Chitose saw several naval actions, taking part in the Battle of Midway though seeing no combat there. She was heavily damaged off Davao, Philippines on 4 January 1942. She covered the Japanese landings in the East Indies and Gilbert Island in January 1942, and was damaged in the Eastern Solomons in August 1942. 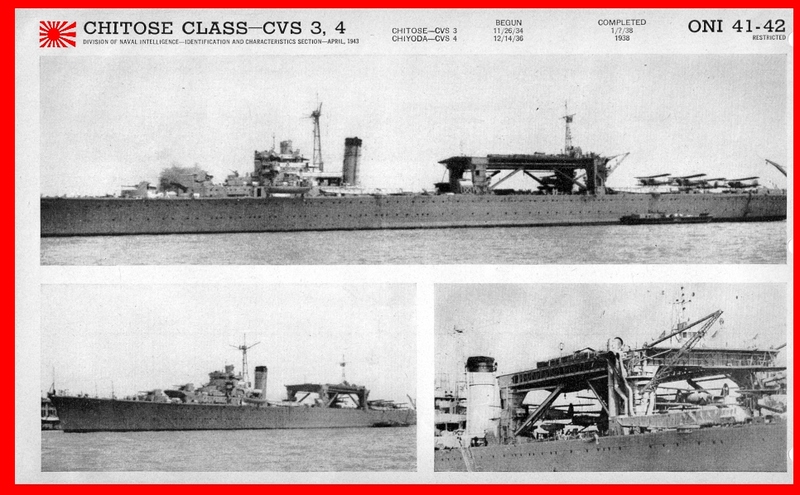 As the Japanese became aware of the importance of carrier aviation, the Chitose was converted to a light carrier at Sasebo Navy Yard commencing 26 January 1943, and was recommissioned 1 November 1943 as CVL (24) and completed as carrier 1 January 1944 and assigned to CarDiv 3. 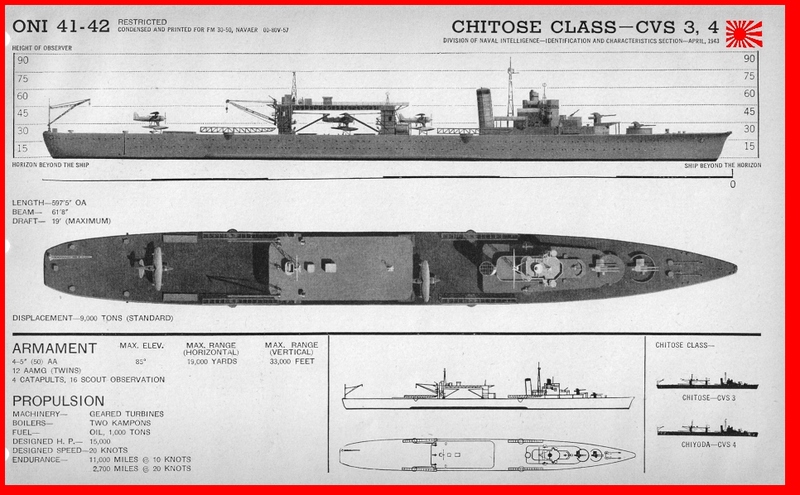 Both Chiyoda and Chitose were sunk by a combination of naval bombers, cruiser shellfire and destroyer-launched torpedoes during the Battle of Leyte Gulf. According to the plan for the Sho-ichi go operation, both carriers were divested of aircraft and successfully used to decoy the main body of the American fleet away from the landing beaches in the Philippines. Chitose was sunk by torpedo hits during the first air strike made by naval aircraft of Task Force 38 from the carrier Essex off Cape Engano. At 0835, she took three torpedo hits, or possibly near misses from bombs on the port side forward of the number 1 elevator. Boiler and engine rooms flooded, and within an hour, Chitose was dead in the water with a list of 30 degrees. At 0937, she rolled over to port and nosed under, with the loss of 903 men. The Isuzu rescued 480 men, and Shimotsuki a further 121.